My family has been playing Hossie for 50 years, and it was always my father's favorite game. Hossie (Hawsy or Horsey) is a bridge-style bidding game played in central Pennsylvania. The name may have it's roots in a German stew called "hasenpfeffer." Hossie is most often played with 4 people on teams of 2, but there are variations for 3, 6, or 8 players (see below). Hossie is played with a pinochle deck which includes 2 cards of each suit from 9 to Ace. No jokers are used. The highest card is the jack of the trump suit, called the "right bower." The second-highest card is the jack of the other suit of the same color called the "left bower." (Example: If diamonds are trump, the right bower is J♦ and left bower is J♥.) The remaining trump cards rank in order Ace, K, Q, J, 10, 9, followed by the other suits from Ace to 9. If there is no trump card played on the trick, then the suit led is the highest rank. Besides naming a suit as trump, there are 2 other choices. 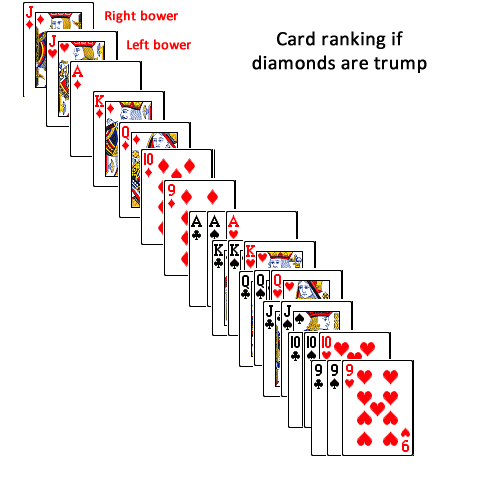 "No Trump," means that cards are ranked Ace to 9 without regard to suit, and "E-Low," reverses that order so that the 9 is the highest ranking card. The first dealer is chosen at random, with subsquent deals passed to the player on the dealer's left. After the deck is shuffled, the dealer passes out the entire deck face down - 12 cards to each player - usually by 3 or 4 cards at a time. Beginning with the player on the dealer's left, players bid the number of "tricks" they believe their team can win for that hand. Six is the lowest bid possible and "Hossie" represents all 12 tricks. After each bid, the next bidder can either bid higher or pass. After a bid of Hossie, subsequent bidders may bid a double-Hossie, then triple-Hossie, etc. If the first 3 players all pass, the last player defaults to a bid of 6 unless they wish to bid a Hossie. The winning bidder names trump (hearts, diamonds, clubs, spades, no trump or e-low). Play begins with the winning bidder who chooses 1 card from his hand and places it in the middle of the table, face up. The player on the dealer's left plays next, following the suit that was led. If the player has no card of the played suit, she may play any card in her hand. Play continues to the left until all 4 players have laid. The player who laid the highest ranking card wins the trick for her team and lays first on the next play. Play continues until all cards are played. Generally the team member who did not win the bid or the first trick pulls in the tricks for the team and stacks them face-down in a zig-zag pattern so you can easily count the number of tricks your team has won. If the winning bid is a Hossie or double-Hossie, etc, the winning bidder has the option of playing the hand as usual or having the partner sit out the hand. If he opts to play without the partner, he may swap up to 2 cards with his teammate before play begins. He may not see his partner's hand to choose the cards. Instead, after the bidder names trump, the teammate makes his best guess in choosing 2 cards to give to the bidder. It is permissible for the bidder to clandestinely show the teammate a card to request a certain suit. If the team who won the bid wins at least the number of tricks bid, they score 1 point for each trick. If they bid a Hossie, they score double (24). A double-hossie scores 48, triple-hossie 72, and so on. The losing team scores nothing. If the team who won the bid fails to score at least the number bid, they lose that number of points, and the opposing team scores 1 point for every trick won. Play continues until one team scores 64 or more total points. 3-Players: each player is dealt 16 cards, and they play every man for himself. 6 or 8 players: Use a second deck of cards and deal all cards. Play on teams of 2 players each. If a player realizes he has laid a card that was not the best choice, he may quickly call "boards back" and take it back as long as the next player has not played a card or called "boards down." If it is discovered that a player has failed to follow suit on any play, called "reneging," that team forfeits the hand unless both sides agree on a way to rectify the error. Your team will forfeit the game if you deliberately reneg or pass signals to your teammate.